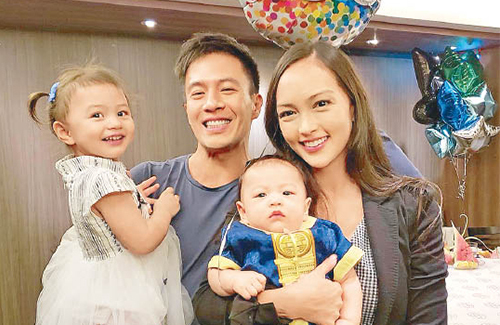 Andy On (安志杰) and Jessica C. are proud parents to daughter Tessa, two years old, and son Elvis, who is now 6 months. On Mid-Autumn Festival, the happy family of four flew to Taiwan so Andy could celebrate the occasion with his mother. Andy and Jessica also celebrated Elvis’ 100 days of birth with a banquet attended by close family and friends. “I’m so happy that all three generations can come together to celebrate,” said Andy. The 41-year-old martial arts star shared that his mother gave Elvis a traditional Chinese outfit as gift. “It was so special!” he said. Andy and his family stayed in Taiwan for a few more days so his mother could spend more time with her grandchildren. Their vacation in Taiwan with family brought back many old childhood memories for Andy. At the 100-day banquet, Jessica said her wish is to see her son grow healthily and happily. She added that Elvis is looking more and more like his father. “I’m seeing two Andy’s everyday now,” she said. Aw. They’re a good looking family. Indeed they are simply gorgeous. Am glad Andy found happiness with Jessica.